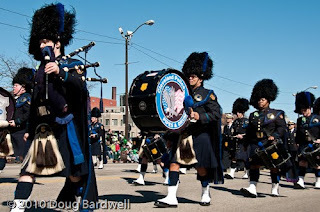 Thousands upon thousands of spectators lined the new parade route in Cleveland for this year’s St. Patrick’s Day parade. With the recent public transit renovations on Euclid Avenue, the parade committee decided that Superior Avenue would be most appropriate for the parade. Typically Cleveland serves up cold and wet weather in the middle of March, so this was a perfect photo opportunity. The tall buildings along Superior cast alternating swaths of shade and sunshine along the length of the street. Finding a location midway down the block seemed to block the soft but steady, cool breeze. So what are the five rules for shooting the parade? 1) Ideally, you want to shoot from the south side of the street. The sun will be behind you at that point and your automatic exposures will be more accurate. If you find yourself stuck on the north side, you can probably improve your images by shooting 1/3 to 1 stop overexposed to keep some detail in your shadow areas. 2) Find a position where you will be least likely to be bothered by people running back and forth across the street. Avoid intersections and deliberate openings in fencing, used to keep crossing to certain areas. By staying as far away from these pesky areas as possible, you’ll greatly increase the chances of getting that great shot you were waiting for. 3) Also, look for an attractive background directly across the street from where you’ll be shooting. That background is going to be in most of your wide angle shots, so make sure it’s not some boarded up building with all sorts of power wires blossoming forth. 4) Shoot your fellow spectators, as well as the parade participants. So often, a glance around you will reveal some very photogenic characters. It’s a great diversion between floats or during lulls in the parade. 5) Zoom in looking for details. Sure, everyone wants that wide view to see the entire float, but after you’ve grabbed that one, zoom in and look for details. Maybe it’s small clusters of flowers on the float, or maybe it’s just the bass drum in the band. By zooming in, you’ll amaze yourself at all the other interesting subjects in front of your camera.